View all products by Woodrift and Co.
Woodrift and Co Yoga West Coasters are modern yet natural, with their stackable live-edge profiles and incredibly smooth surfaces. 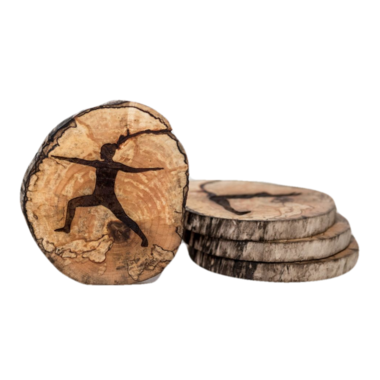 These coasters are made using scavenged driftwood from beaches all over Vancouver Island; they never cut down a single tree. Each log is different, transformed by natural processes to reveal spalting, stunning natural colours and wood grain textures. A combination of natural mineral oil and beeswax coats and protects the coasters from stains and damage without any toxic chemicals. The coasters come in sets of four, stacked in their original log profile and packaged with natural rubber bands instead of plastic for minimal environmental impact. Feel good about this sustainable, natural and chic addition to any home. Please note that due to the nature of the materials used, the sizes and colouring of some products may vary.